Compact module station TERRA CMH3000. All parameters of modules are controlled by program via data bus. Local or remote control and monitoring on PC base. Extended diagnostics and backup function. 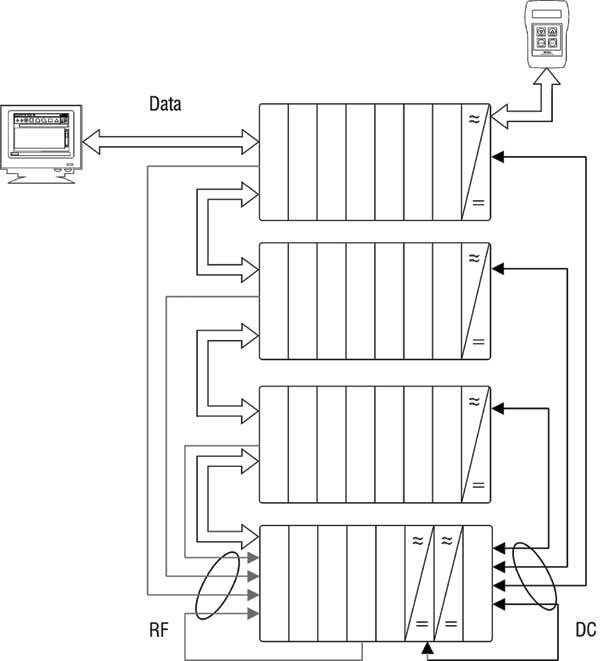 Open architecture of system gives possibility for easy integration of new components. Excessive backup of station supply. Possibility of “hot” installation and/or replacement of modules. Possibility of “hot” installation and/or replacement of modules. Crate of base unit of station CMH3000 has width 19" and height 6U. Each crate has eight identical slots for eight modules. Power supply feed and control signals, summarizing as per HF output signals and supply of input HF signals is carried out by means of passive bus. Optionally one can install output amplifier and distribution panel of input signals. One can connect up to 16 crates via one USB port and PC. With the help of manual programmer one can manage up to 16 modules installed in two crates (connection via connector installed on the front panel of power unit). Station modules are supplied from one module of relatively high voltage. This allows realizing backup system of station power supply. Power supply sources can be switched both in parallel and through switchboard for N+1 backup. All supply elements as per DC are built at highly effective pulse transformers. 8-x input HF summator is integrated into each base unit. In case of big installation output signal of HF signal of crate can be amplified by means of buffer amplifier. The further summation as per HF by means of system summator and amplifying of module amplifier of great power. Input distribution panel can be completely installed into crate. This allows realizing needs in individual supply with signals of station modules. As well standard versions of distribution panel are available both to carry out redundancy N+1 of channel modules and other standard distribution circuits.